As a Republican, Thaddeus Stevens rose to become the chairman of the House Ways and Means Committee. During the American Civil War, this post made Stevens the most powerful member of the House of Representatives, responsible for designing and shepherding bills through the House that would both raise the funds for the war effort and authorize the immense expenditures required to fight it. Confederate troops under the command of Jubal Early destroyed one of Stevens’ remaining holdings in Adams County, the Caledonia Ironworks, on their march toward Gettysburg in late June 1863. 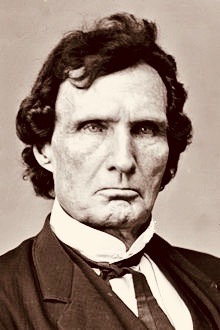 With the Civil War drawing to a close in January 1865, Thaddeus Stevens delivered the final speech during the debate of the Thirteenth Amendment to the Constitution of the United States. As the leader of the Radical Republicans, Stevens had pressed the issue of abolition throughout his time in Congress, and on Jan. 31 secured victory with the passage of the amendment. After Lincoln’s death, Andrew Johnson rose to the presidency, and Thaddeus Stevens recognized him as an enemy. 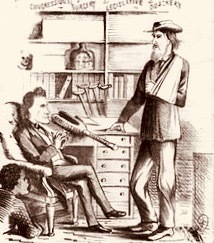 Within a year of Johnson assuming office, Stevens and the Radical Republicans had enough votes to override Johnson’s veto on a regular basis, beginning with the passage of the Civil Rights Bill of 1866. This conflict culminated in the impeachment of Andrew Johnson in 1868, during which Thaddeus Stevens served as one of seven members of the House that managed the impeachment proceedings. By this time, Stevens was physically weak to the point that he had to be carried through the Capitol on a chair. Johnson was acquitted in the U.S. Senate by one vote.